Parliamentarian Wimal Weerawansa is scheduled to be questioned today over the alleged financial fraud reported at the State Engineering Corporation (SEC), which came under his purview as the Minister of Construction, Engineering Services, Housing and Common Amenities of the previous government. Weerawansa, the National Freedom Front Leader, will be questioned by the Police investigators of the Presidential Commission of Inquiry to Investigate and Inquire into Serious Acts of Fraud, Corruption and Abuse of Power (PRECIFAC), an official said. He said that the police investigators would question him over the complaints regarding his alleged distribution of houses among his close relatives and also the leasing of their vehicles to the SEC. “ During his tenure, some vehicles which belonged to his close relatives were leased to the SEC and payments for fuel and other costs had been paid to them,” the official told the Daily FT. Meanwhile, the PRCIFAC is also investigating another complaint against him over selling luxury houses worth many millions for much cheaper rates among his close relatives. The official said that those houses in Mattegoda and Kahatuduwa were built by the Ocean View Development Company Ltd which comes under the National Housing Development Authority. The Company, which is the first state owned housing and property development company, issuing a statement on May 17 had announced that a financial irregularity had occurred when Weerawansa was the Minister of Construction, Engineering Services, Housing and Common Amenities. 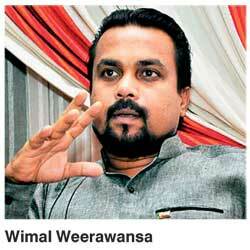 The company, which makes three allegations against Weerawansa, claims of misusing Rs. 14 million in printing diaries and calendars, which were printed without following the normal procedure of the institution, misusing Rs. 71 million in the sale of six luxury houses constructed by the Company in Mattegoda and Kahatuduwa, which were given to his close relatives at low costs and the case of paying annual wages of Rs. 60 million to 12 workers of the company who were political supporters of Weerawansa. PRECIFAC officials said that Weerawansa was issued summons to give a statement in mid-July but he asked for a later date. Investigations will be carried out by a team of police investigators led by ASP Lalith Abeysekara and assisted by the Chief Inspector Geethika Bodhipaksa and Inspector Anuradha. Basil remanded till 8 Aug.
Kaduwela Magistrate Dhammika Hemapala yesterday further remanded former Economic Affairs Minister Basil Rajapaksa who was arrested over alleged misappropriation of State funds to purchase and distribute GI pipes to Local Government institutions during the run-up to the last presidential election. The Magistrate also ordered the Financial Crimes Division (FCID) to probe all bank accounts belonging to Rajapaksa for further inquiries.